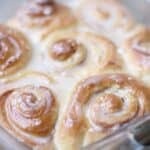 These perfect cinnamon rolls are delicious, light and fluffy. Sometimes you just feel like something warm, sweet, and delicious…and nothing else matters! Am I right? I wish I had a good excuse for wanting to eat the whole pan by myself. I’ve got a sweet carbs addiction. 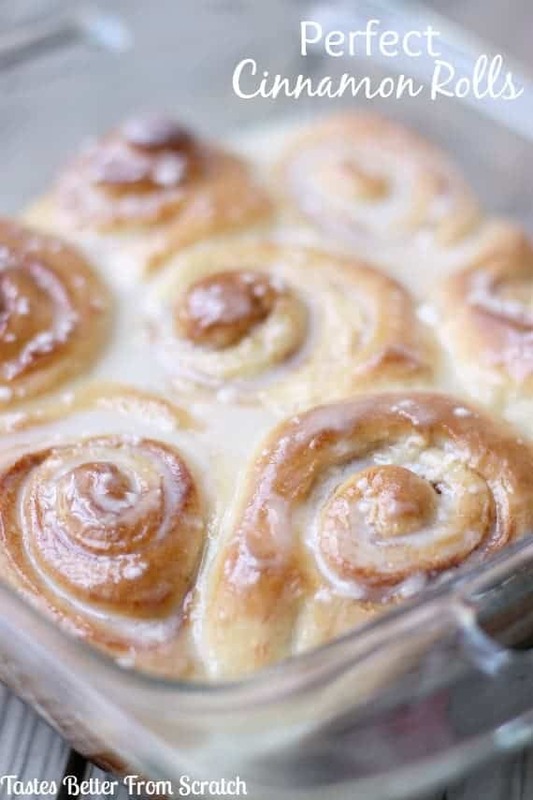 These homemade Perfect Cinnamon Rolls are ideal for a sweet, special breakfast or brunch! (Or if you’re like me and you just want to indulge on an average Sunday morning!) Weekends are for baking, and I’ll definitely be making these this weekend! I adapted this recipe from the Paula Deen classic, (so you know it’s going to be amazing!) and it’s totally fool proof! 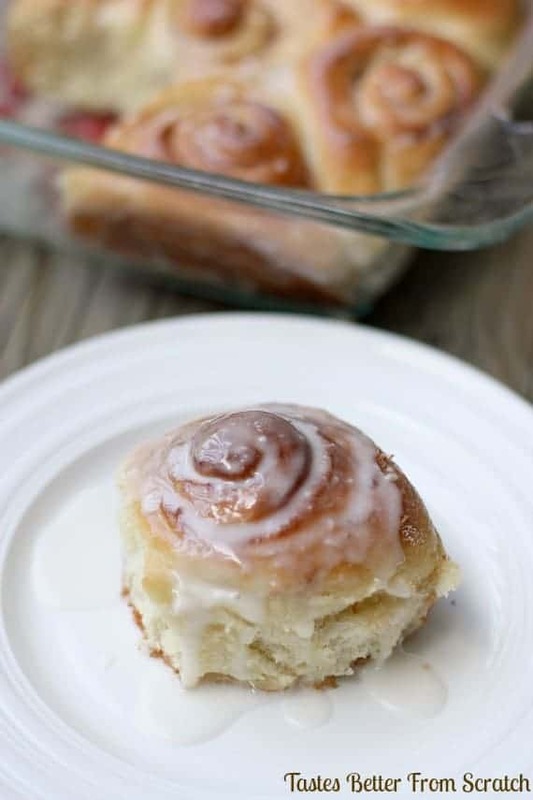 They’re fluffy and light and everything that homemade cinnamon rolls should be! The classic glaze recipe below is amazing, but if you’re looking to kick these up a notch, try them with my homemade cream cheese glaze! Freeze what you don’t eat. These freeze really really well! If you want to save them for a few days (or weeks), pop them in the freezer and defrost them or heat them for a few seconds in the microwave as you want to eat them. In a large bowl mix milk, sugar, melted butter, salt and egg. Add 2 cups of flour and mix until smooth. Add yeast mixture. Mix in remaining flour until dough is easy to handle. Knead dough on lightly floured surface for 5 to 10 minutes. Place in well-greased bowl, cover and let rise until doubled in size, usually 1 to 1 1/2 hours. When doubled in size, lightly punch down dough. Roll out on a floured surface into a 15 by 9-inch rectangle. Spread thin layer of melted butter all over dough. Mix sugar and cinnamon and sprinkle over buttered dough. Sprinkle with walnuts, pecans, or raisins if desired. Beginning at the 15-inch side, role up dough and pinch edge together to seal. Cut into 12 to 15 slices. Coat the bottom of baking pan with non-stick spray. 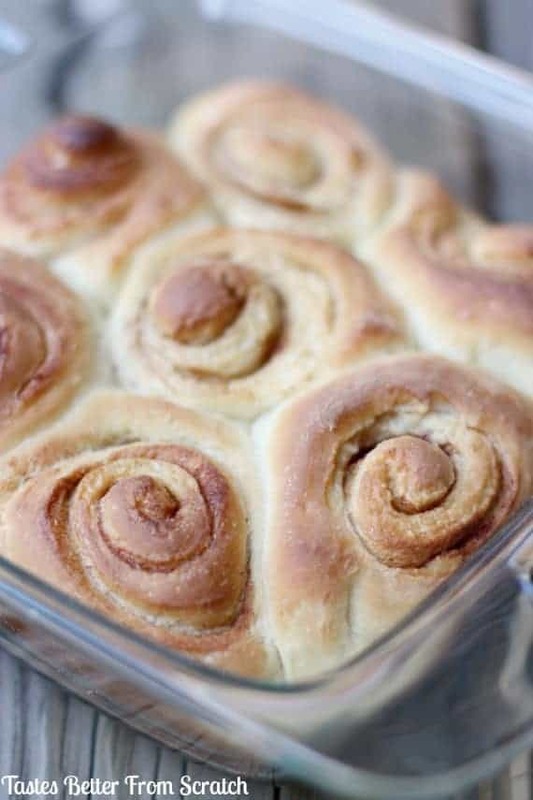 Place cinnamon roll slices close together in the pan and let rise until dough is doubled, about 45 minutes. Heat oven to 350 degrees F. Bake for about 30 minutes or until nicely browned. Meanwhile, mix butter, powdered sugar, and vanilla. If I made these the night before could I refrigerate them over night and then bake? I prepared the rolls the night before, didn’t let them do the second rise but just covered the pan and put them in the fridge right away. Next morning I took them out and let them sit out for 15-20 minutes then put them in the oven. They turned out great! I’m so glad you liked the orange rolls! These are great too. I made them and they were amazing! We loved them! Has anyone tried making the night before and baking the next day?